Tools traditionally used by planners for guiding development and environmental management can also be used to build resilience by reducing a community’s vulnerability to hazards, to mitigate risks, and to lessen negative impacts of climate change. Louisiana communities face tremendous uncertainty from increased flooding, wind damage, environmental degradation and changes to the National Flood Insurance Program. Planners can effectively mitigate these risks, build resilience, and plan for prosperity through a careful use of ordinances, codes and design. The planning tools and policy instruments a community uses can provide efficient and cost effective ways for integrating hazard mitigation plans and actions, and preparing for environmental risks and the impacts of climate change. In recent years, many Louisiana communities have revised or developed new resilience-based zoning ordinances, development codes and design guidelines intended to reduce risk. This workshop brought together planning consultants, design professionals, and local community planners who have worked, are currently working, or are preparing to work with these tools to build resilience. The experiences and insights presented by the speakers as well those shared among participants, provided inspiration paired with solutions. These included specific ideas and tangible projects that have been undertaken across Louisiana to address the challenges of living with risk, and finding opportunities to strengthen communities. 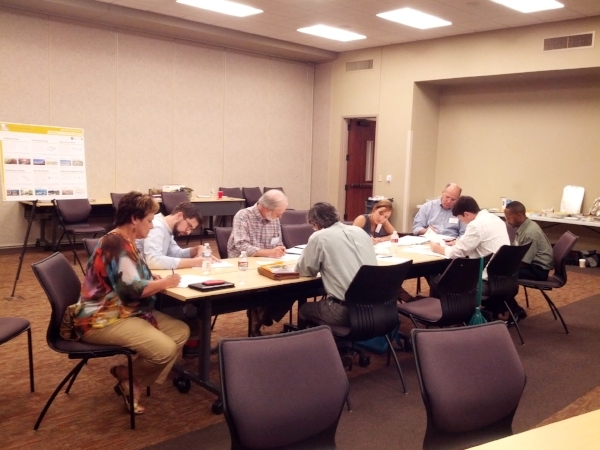 The workshop was held on Tuesday, September 10, 2013 at the Picard Center in Lafayette, LA, from 9:00am – 3:00pm. The day kicked off with introductions by Jeff Carney, Director of the Coastal Sustainability Studio and Associate Professor in the LSU School of Architecture, and Mike Hollier, Planning Manager in the Lafayette Consolidated Government. A short summary of each session is provided below. Steve Villavaso, JD, principle at Villavaso and Associates, planning consultant, and lecturer on planning law, provided a foundation for planning law in the US and in Louisiana. He spoke of the legal basis for planning at the federal and state level, and specifically focused on court cases that upheld zoning. Mr. Villavaso discussed several Louisiana cases, which established and upheld the right of a community to designate, regulate, and alter land use and development, as an appropriate use of local police power to ensure the public health, safety, and well-being of a community. Furthermore, he made the case that these regulations can also be applied to addressing environmental risks and hazards. In this session, planning consultants drew on years of experience to highlight specific and creative approaches for reducing risk and building resilience in Louisiana communities. Lu Cutrera, planning consultant with T.Baker Smith, landscape architect, and planner, presented the creation of a cultural district in Morgan City. A thorough analysis of flooding risk and soils in the city identified the safest areas for residents and businesses as the sites of the city’s earliest buildings. However, these sites currently include many dilapidated, abandoned, or blighted properties. The new cultural district overlay is securing funds for, and directing development to, these areas. By targeting the safest areas of the city for re-development through incentives, Morgan City has found an opportunity to draw on its environmental assets while reducing development in more risk-prone areas. Mr. Cutrera encouraged participants to utilize this strategy in their communities, as well as to look for other creative ways to pair risk reduction and development with different funding opportunities. Dana Brown, principle at Dana Brown and Associates, landscape architect, and planner, discussed stormwater management best practices, at the site and neighborhood levels. She presented examples of how stormwater management techniques can be introduced into communities and help reduce flood risks, through zoning ordinances, subdivision requirements, and design guidelines. Ms. Brown illustrated the impacts that these measures could have on a single site or an entire community, and encouraged participants to create opportunities for improving their communities by incorporating such design guideline regulations and requirements for professional design and implementation. Steve Villavaso concluded the session with a story reflective of some of the difficult decisions planners are faced with as they work with different stakeholders, interest groups, and landowners. In this session, speakers explained the situations in their local communities – specifically what their needs are and what zoning and planning tools they are employing to address those needs. Cathie Gilbert and Sara Fawcett-Gary gave an update on their process for developing a new Lafayette Comprehensive Plan, as well as their existing regulations. Lafayette will soon begin work on a new Unified Development Code, and they are interested in new ideas for guiding development. Their current concerns related to environmental risk include adequately addressing septic use in unincorporated parts of the parish, introducing green infrastructure, resource conservation, and hazard mitigation. Eric Lundin, a planner for the City of Slidell, presented the challenge of reducing risk in a city that is extremely vulnerable to flooding. The majority of the city lies in the Special Flood Hazard Area V-zone, while even critical facilities are located in A-zones. As there are not options for moving out of the A-zone within the city limits, the planners in Slidell are working to reduce risks and mitigate impacts through a number of programs and regulations, including a zoning ordinance, subdivision regulations, stormwater ordinance, landscaping requirements, and the Municipal Separate Storm Sewer System, among others. Slidell is currently in the process of adopting a new Unified Development Code, which will help simplify and clarify the many requirements affecting a development from different ordinances. Jeannette Dubinin of CPEX presented elements of their Coastal Land Use Toolkit, specifically addressing ordinances, zoning, and subdivision codes. She discussed how the recommendations can provide general knowledge for communities about these issues, to live and develop in ways that are more mindful of their context, environment, and risks. Session 4: Break-Out Group Discussions: How can my community use zoning ordinances, codes, and design to build resilience? In this final session of the workshop, participants broke-out into groups to discuss challenges their communities are facing, approaches they are currently using, and opportunities for further addressing risk. 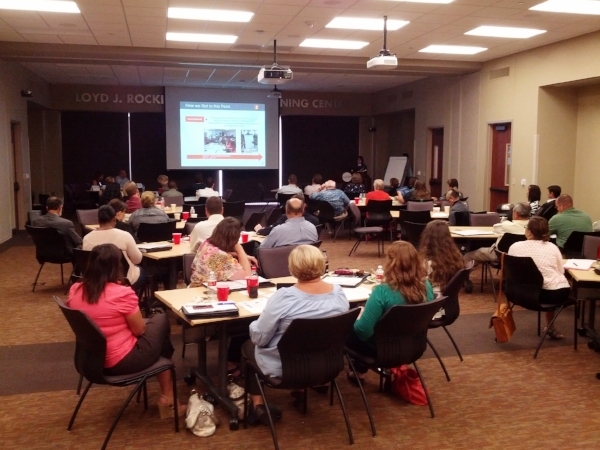 Workshop attendees were able to earn 2.5 hours of continuing education credits towards AICP CM for the morning sessions. In preparation for this workshop, the CSS produced a packet describing regulatory and incentive-based planning tools that can be used not only to guide development, but also to build resilience by mitigating risks and proactively preparing for adverse impacts of climate change.